When wildfires were ravaging record amounts of forest in B.C. this summer, the Canadian Armed Forces were there. They spent 10 weeks assisting the province in managing the situation through Operation LENTUS. The Canadian Joint Operations Command (CJOC) directed the regional joint task force responsible, as it does for most of the Forces’ operations. It administers the day-to-day management of all kinds of missions for the Chief of Defence Staff, including domestic and global challenges, ensuring Canada’s goals are met. CJOC has six standing regional Joint Task Force Headquarters across Canada, as well as a network of units and task forces that are deployed abroad. Esprit de Corps’ Sandrine Murray recently sat down with CJOC Commander LGen Stephen Bowes to discuss the organization’s efforts, evolution and future. This interview has been edited for length and clarity. Esprit de Corps: Since you assumed command of CJOC, what have been your team’s main efforts? LGen Bowes: I assumed command back in June of 2015, so it’s been two and half years now in this, and I’ve seen the evolutions go through. I’ve seen a government come into office and one of the first big tasks they had was what we called Operation PROVISION, which was to facilitate the movement of Syrian refugees into Canada. We played a role there, on the domestic side. [Domestic operations are] rather routine for us, in a sense. What we’ve done in British Columbia this summer is not new — we were fighting fires in Fort McMurray and Saskatchewan the years before — and we also supported New Brunswick during the ice storm on the Acadian Peninsula. That’s a very normal set in the run of a year. We’re basically supporting other arms of government as the leads, in bringing the capabilities that we have —both in equipment, but more importantly in people — to those challenging circumstances. When I look at the world, we break it down in three ways: Canada, North America and the periphery — the United States, Mexico and the countries of the Caribbean — and then we look at the broader set of the world. You can subdivide that in terms of Canadian priorities, but those are the three that allow us to understand what the world really is. We have an air task force that’s in Romania; a maritime task force that’s in the waters off of Europe; and a land task force that’s in Latvia. That consumes quite a bit of our time, so our focus is managing that mission. We’re in the Middle East and of course the [Persian] Gulf region. And we support a wider set of smaller missions that are currently in support of the United Nations, but also in support of things like the Multinational Force & Observers [an independent international organization] in the Sinai. We’ve been there for quite some time; it’s a very successful peace support mission between Egypt and Israel. We are also part of something called Operation PROTEUS, which is to support the United States in building up the capacity of Palestinian security forces in the West Bank. We have people in Jerusalem, and across the West Bank, helping to build the capacity of the Palestinian security forces. So there’s a range of missions that are out there. And at the end of the day, the underlying theme in all of this is we focus on the management of the missions and their sustainment. I divide my responsibilities. I also oversee a joint training program that helps bring all the domains of the Canadian Forces together. Every day I go to work, I am concerned about the Forces’ protection and the well-being of our people that are deployed wherever they’re at, be it Canada or abroad. Esprit de Corps: Have things changed at all since you took command in 2015, in the structure of the command, in its mandate or goals? LGen Bowes: The CJOC I took command of is the same basic organization that we have today. We perhaps adapt and change small positions based on the missions, but CJOC is a broader team. It’s a joint team that’s right across the country. We have a joint air component commander in Winnipeg; we have a maritime component commander in Halifax. That structure hasn’t changed. In terms of the cycle of the tasks, things ebb and flow. You wouldn’t be surprised to hear that I see more on the environmental side. I’ve certainly seen more active engagement by the military in support of other government departments and other branches of Canadian government writ large. I don’t expect that to change too much. There will always be fires and cycles, so we will continue to help Canadians in need as called upon by the appropriate provincial or federal authority. And the trends on the international stage have not changed in the last number of years. Our challenges are still the same. And that’s unlikely to change in the near term. Esprit de Corps: What have been your main challenges in commanding CJOC? LGen Bowes: We have a very small force, and we have proven ourselves time and again to the Canadian people and the Government of Canada by delivering operational excellence. And the reason I refer to the smallness of the force is that, well, people tend to identify ships, planes and armoured vehicles, but our most important resources are people. The most important capability they bring to the table is their intellect: It doesn’t know gender, race, creed, colour, or sexual orientation. As we go forward as an organization, it’s how we ensure that the right person with the right skillset is appropriately trained, has the intellect and is assigned to the task. We went through a period in the early part in this decade where our budgets shrunk dramatically. The force got smaller. Now we’re in a period where we are trying to grow in response to Strong, Secure, Engaged — the defence policy of the Government of Canada. But at the same time, growing is a challenge. We are more active than we were three to four years ago. We have more people deployed on operations. When I come to work every morning and leave every day, I’m always thinking about our people. Where is the CJOC headed in 2018? LGen Bowes: I see a continued uptake in the tempo. By tempo, I am referring to our personnel, primarily. We stand by for orders from the government through the Chief of Defence on peace support operations, as an example. If that comes down the pipe, then we will launch out in whatever direction that is given. But based on where the world is at, based on what I’m seeing, in the broader Middle East region, in Europe, in Africa, and in terms of weather and environmental challenges, I think the tempo of Joint Operations is going to be higher in the years ahead. And therefore, we seek to set the conditions to sustain that. My perspective in this job is a lot shorter in timeline than others. Our service chiefs and others take a look at the longer term, they acquire equipment based on a longer-term piece. I’m focused very near-end, very day-to-day. I still look ahead and I still participate in that dialogue, but the Chief of Defence Staff is looking to me and our team here in Joint Operations Command to have a focus on the day-to-day operations and the near-term challenges. We think in terms of rotations of our forces overseas. With a previous rotation that may have come out from an operation, we go through a formal lessons learned process. We identify where we need to make changes, how we prepare the force, and what its structure should be. We manage the force that’s there in the moment, and then we look ahead to say, ‘here’s the things we need to do to enable the next team that goes in to have success.’ The clear message coming out of that is our focus is delivering excellence in operations. But excellence in operations is entirely dependent on your personnel. What is your favourite movie? The Hunt for Red October. Your favourite travel location? Disney World. I last went there with my granddaughters. If you could have one superpower, what would it be? Seeing the future. Favourite sports team? Montreal Canadiens. Your favourite meal? I love food period. Steak … but Thai food would be up there. If you could sit down with one historical figure, who would it be? People who found themselves at a key moment in time and changed the course of history … Abraham Lincoln, Churchill, Roosevelt. When you were growing up, what did you want to be? I think I wanted to be an athlete. High school to me was football in the fall, hockey in the winter, and baseball in the spring. You can listen to only one song the rest of your life. Which would it be? I can think of a couple of Beatles’ songs. Hey Jude has got to be up there. 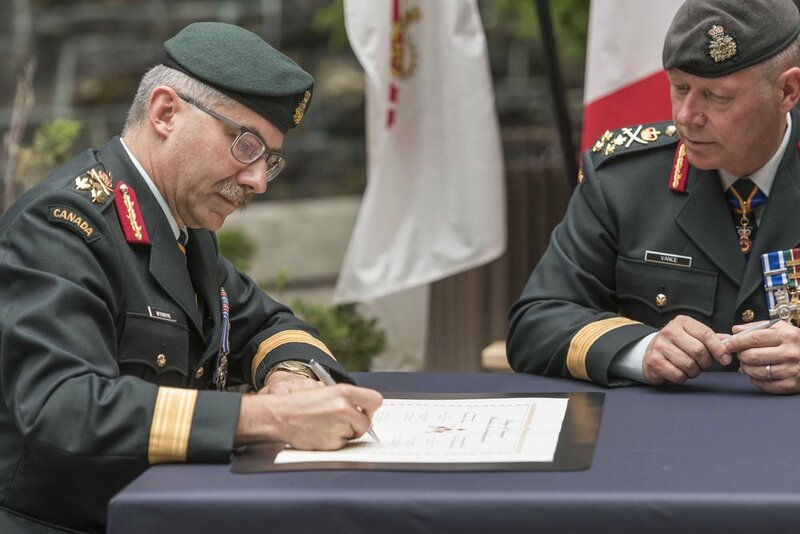 Since February 2014, Major-General Michael Rouleau has been the commander of the Canadian Special Operations Forces Command (CANSOFCOM), the Canadian government’s force of last resort for operational command. Its five different units — Joint Task Force 2 (JTF2), the Canadian Joint Incident Response Unit – Chemical, Biological, Radiological and Nuclear (CJIRU-CBRN), the Canadian Special Operations Regiment (CSOR), 427 Special Operations Aviation Squadron (SOAS), and the Canadian Special Operations Training Centre (CSOTC) — are ready to respond to a wide range of missions, including: hostage rescue, maritime special operations, and combating weapons of mass destruction (WMDs). Special Operations Forces members are highly trained personnel ready to respond to missions of strategic significance. Esprit de Corps’ Sandrine Murray sat down with MGen Rouleau on September 19 to hear his thoughts on how the organization has changed since its creation in 2006, mental health initiatives within the organization, and where CANSOFCOM is headed next. This interview has been edited for length and clarity. Esprit de Corps: What do you find makes Special Operations Forces soldiers unique? MGen Rouleau: There’s an uncommon level of commitment for the individuals who work here, and once they get here it’s a lot of work to be here. It’s a high-pressure environment; the expectations are very high. It’s an ongoing commitment. You don’t just get in the door and coast. There’s no such thing as coasting. We’re always going pretty hard at our job. What makes us unique though goes beyond the soldiers. We’re organizationally unique. We’re a very agile organization. We’re very flat as an organization, so we move quickly. We don’t have a lot of structure and hierarchy built into our organization. It allows us to move very quickly on issues to build, break, hack, iterate and do it all over again. Esprit de Corps: Since you took over in February 2014, have there been any changes to the organizational structure? MGen Rouleau: Special Forces has always had reserves of excellence at the tactical level. People do very well on the ground. But I felt where we needed to mature was as a Level 1 organization in the military, at the same level as the Army, the Navy and the Air Force. I felt that we had some distance to go to mature as that organization. I think we’re more coherent as a force right now, than we were. We’re more sustainable and forward-thinking in institutional terms. It’s not just about doing a great job, but about sustaining ourselves as an organization over the long term. Esprit de Corps: Has it proven to be a challenge to be more open? Especially with the nature of the Special Operations Forces? MGen Rouleau: With running any organization, there are always challenges. There are always opportunities as well. There have been challenges wanting to open up more, as it would be unwise and unsafe. But, in opening up more, people’s appetites increase, especially about capabilities that relate to the national interest. There has been challenges internally — cultural challenges. Because we’ve operated in relatively closed-off ways, opening up more sort of makes my people ask the question, “Well, why are we doing this?” But Canadians can’t support something they know nothing about. And frankly, as a vehicle to recruiting more people, but also as a hedge. Because there’s always going to be not-so-great things happening in every organization and if you have nothing on the positive side when something bad happens, there’s nothing to balance it off with. There’s evidence of that in our outreach, here sitting with you. But like everything else in life, it has to have balance to it. Esprit de Corps: The Liberal government promised $62-billion over the next 20 years and that includes 605 new Special Operations Forces soldiers. What are your thoughts? MGen Rouleau: I am delighted. The CDS [Chief of the Defence Staff] had approved our growth a year ago within the Canadian Armed Forces, but that was affirmed now by government policy. We are going to grow by an additional 600 plus, which will bring us to just under 3,000 uniformed people, which is tremendous. That is going to allow us to develop depth, so that I won’t have to necessarily work my soldiers as much as I do now. I would just point out though, those 605 people, they’re not going to be all special operators. You’ve got some operators, whether it’s a JTF2 operator, CJIRU operator in the chemical-biological space, or CSOR operator. We’re also giving some of those positions to our Air Force squadron, to our helicopter squadron. I have given the commander of the Air Force a certain number of those positions, so we can further develop the helicopter squadron. We are going to flesh out our schoolhouse as well, in Petawawa. But I would also like to point out that we’re growing in the civilian defence team side. Because it would be out of sync to just grow uniforms but not the defence team. An effective CANSOFCOM is like a team effort, a team sport. I need my civilian defence team members to be a balanced element with my reserve members and with my regular members. It’s a balanced people portfolio that’s really going to help us get even better in the future. The last point I’d make is that one of the things we mention often here is growth, [but that doesn’t always mean] bigger and bigger. Growth for us is better and better. There’s a difference. I am not looking for the biggest CANSOFCOM possible. Because every person we grow by puts risk on our culture, on our uniqueness, on our specialness. What I want is a CANSOFCOM appropriately big enough to handle the future load that we think we’ll have to carry, but not one person bigger than that so that we’re not putting at risk our culture, and furthermore, that we’re not taking people away from the Army, the Navy and the Air Force, because we’re part of a bigger team. Esprit de Corps: Is there any story you have the freedom to share that can reflect the reality of special forces and the level at which they operate? MGen Rouleau: Two of my three tours at the Balkans were in non-special forces context. I got to the Balkans in 1991, right at the start of the conflict, and my last tour was in 1997. Reflecting on my special forces tour that occurred in 1997, I was a captain leading a small team back then. It was a different time. The Canadian Armed Forces hadn’t had Joint Task Force 2 for very long. It had only been around for four years operationally at that point. It was a young unit. It was not well-known, so it was hard to integrate into operations. We did some good work back then, but we were sort of trying to find our way even when we were deployed. When I think of operations now, I command and control my deployed forces. And I think that’s an important point to make, because I work for the Chief of the Defence Staff. He gives me my orders. I translate those orders to a commander I deploy, and that commander works for me. There’s an unbroken chain of clarity and speed in that system. And that’s not the way it was in the early years. Every relay doubles the noise and cuts the message in half. Esprit de Corps: Has there been an increase in services offered to members of the special forces? MGen Rouleau: I’ve got 30 years in the military and in the past several years I’ve seen such a difference from my first 25 or 27 years … it’s incredible. And it’s a good thing. My job as a commander is to establish the correct climate and culture for my command. Fundamentally, that’s one of my most important jobs. I’ve tried to make a strong point with my subordinate commanders for people to understand that mental health is no different than physical health. We would never leave a trooper with a broken leg untreated. And so why would we ever consider leaving someone with a mental health concern untreated? It makes no sense. We’ve expanded; we spent a lot of time, about a year’s worth of work, putting together special forces mental wellness. We hired experts in the field; we supplemented our organic psychologists with other experts. We brought a multi-disciplinary team together: padres, social workers, psychiatrists, sports performance specialists, and human performance specialists. We developed a special operations mental agility program, which is a training program that gives people tools to be able to contend with stressors in life. More broadly, we developed the Optimizing Performance Force and Family (OPF2) initiative. The OPF2 targets an operator demographic, and everyone [fits into the] CANSOFCOM demographic and a family demographic. It’s a regime of tools to help them contend with the stresses of working here, or being with a loved one who works here. It’s not just about helping people who work here. It’s about giving them the tools they need to not get broken in the first place, hopefully. But more than that, if they are hurting, it’s about taking care of them because there’s more to life than the military. We all have lives after the military, and I don’t want my people to ever leave the military broken. On June 21, 2017 Esprit de Corps journalist Micaal Ahmed met with Lieutenant-General Paul Wynnyk, Commander of the Canadian Army, for an in-depth interview on the current challenges facing the Canadian Army and plans for the future. The text below has been edited for length and clarity. Esprit de Corps: General, first of all, allow me to thank you for taking time out of your busy schedule to chat with Esprit de Corps today. It is most appreciated. You have been the commander of Canada’s Army for nearly a full year now, and this has been a period of great transition for the Canadian Armed Forces. What would you say have been your three greatest challenges to date? LGen Paul Wynnyk: Well, I think the challenges are common to any Army Commander. There is one constant challenge, and that’s making sure that our troops are prepared for operations both at home and overseas. As a force generator, that’s probably the most important thing that we do here in the Army — to make sure that our troops are well-trained, well-led and well-equipped for operations. I would say that what’s unique about last year is the work we’ve done on preparing for the release of the new Defence Policy: Strong, Secure, Engaged. The last policy we had was in 2008, so it’s not something that comes up on every Army Commander’s watch. I sit on the Policy Committee, and in fact I’m the only service commander that sits. So, that was challenging in a very good way. We had the opportunity to shape the next 20 years, which is a privilege most Army Commanders don’t experience. The third challenge … [speaking of Operation HONOUR, which addresses inappropriate sexual behaviour in the Canadian Armed Forces] is ensuring that every member of the Canadian Army understands the importance of respect for others. We constantly place emphasis on treating our people right. Sexual misconduct is but one aspect of treating our people right and acting ethically. In fact, I’m not sure I would call it a challenge, but the way we do business. Obviously, there are issues that come up from time to time, and we deal with them, but I think the emphasis that [Chief of the Defence Staff] General Vance has placed on this issue and the buy-in that we have from the entire leadership across the Canadian Armed Forces, is paying dividends. Esprit de Corps: Following up on that theme, in what area would you feel you have accomplished the most positive change to date? LGen Paul Wynnyk: I wouldn’t say that I have personally accomplished anything. I mean, I work here with a fantastic Army team. I think we’ve made a lot of progress in the last year on strengthening the Army Reserve — that has been a big priority. And, as you probably read in the new Defence Policy: Strong, Secure, Engaged, this is the first Defence Policy that has a separate section dedicated to the Reserves. We are also making progress in actually devolving a number of responsibilities and authorities right down to the unit level. A good example I’ll use is recruiting for the Army Reserve. Prior to the first of April, recruiting was centrally controlled through the Chief of Military Personnel, and it was a rather lengthy process. The average time to get into the Army Reserve, and I suspect it was the same for the other Services, was about six to seven months. As you can well imagine, for most of our younger people who want to join — 17, 18, 19 years old — most of them are not willing to wait around for that length of time and seek employment elsewhere. So what we’ve done is we’ve transferred the authorities and responsibilities from the Chief of Military Personnel and we’ve pushed it right back down to the unit level. So now a young person, in their last year of high school or first year of university, can actually walk into a local armoury, conduct a number of tests — there’s the basic physical fitness test, we do a medical screening, we do a basic criminal background check — and they can be enrolled in as little as two weeks. We’ve actually proven that concept. From my point of view, that’s huge because that should be able to increase the strength of a number of our units. We’re competing for young Canadians with skills; we’re an employer. We need to get people in, and a seven-month waiting period just hasn’t done it. So I’m confident this initiative will help maintain and increase the strength of the Army Reserve. And there are more significant initiatives in the Defence Policy. You may have noticed that one of the more significant changes is guaranteed summer employment for the first four years of reserve service. That, from my point of view, greatly incentivizes reserve service. For example, if you’re a university student, you get a break May-June-July-August. Well, if you’re a member in good standing in a Reserve unit, you’ve got guaranteed employment. You can essentially pay your way through school with your reserve service alone. Following the June 21 sit-down interview, Canadian Army Commander LGen Paul Wynnyk took a few minutes to talk about some of the memorabilia and photographs that adorn his office walls to Esprit de Corps’ Micaal Ahmed. The other thing that I’m very proud of is all the work that was done in setting up the enhanced Forward Presence mission for our battle group in Latvia. This is essentially breaking new ground. We haven’t had troops permanently assigned to Europe since the end of the Cold War — we pulled out in the early 1990s — so there’s not a lot of memory here about what’s involved in stationing and sustaining troops in Europe. And, starting next year, we will have a national command element in Europe — up to about 30 folks who will be permanently posted to the Riga [Latvia] area with their families. These are three-year postings, in addition to our battle group rotating through on a six-month basis. So those are but two examples of recent Army achievements. Now these are not things I have accomplished; these are things that the Army as a whole has accomplished, and I’m just privileged to lead. Esprit de Corps: In regards to Canada’s enhanced Forward Presence, many have questioned whether this is an unnecessary provocation of Russia given that, as a NATO member, Latvia is protected under Article 5 of NATO’s charter, which guarantees collective defence to all member states. In your opinion, does the deterrent factor in this case outweigh the risk of provocation? LGen Paul Wynnyk: Absolutely. If anybody is provocative, it’s been Russia. I mean, they invaded a sovereign state — they invaded Ukraine. I’m a big believer that deterrence is necessary in Eastern Europe, particularly in the Baltics. And, once again, the Baltic states are NATO members and requested our presence in their countries — they all have small militaries — so I think it’s absolutely the right thing to do. Esprit de Corps: The Liberal government recently released a Defence Policy review. What were your initial reactions to the changes and what will this mean for the Army in particular? LGen Paul Wynnyk: If you look at this policy the way it’s actually structured, people come first. I think this sends a powerful statement in itself. It doesn’t apply just to the Canadian Army; it applies to the Canadian Armed Forces. But it really speaks to, first of all, addressing our most important asset, our most precious asset, which is our personnel. Making sure that we have the institutions in place, the services in place, to support not only our servicemen and servicewomen, but also their families. A new transition unit will be set up to make sure that, as people transition out of the Canadian Armed Forces that everything is done properly. There will be no waiting for pensions and medical issues including a solid transition of files to Veterans Affairs will be done before servicemen and servicewomen are released. So I think that’s very positive, not only for the Army but for the Canadian Armed Forces as a whole. There are a number of explicit statements about equipment purchases, as we go forward, that we didn’t have in the past. Plus, this Defence Policy has been actually costed for the future. I’ll give you a couple of examples: logistics vehicles, trucks — something that we’ve struggled with a little recently — and ground-based air and munitions defence, which is a capability deficiency that we have in the Canadian Army. All is now above the funding line. Esprit de Corps: One of the recommendations made in the Defence Policy review is to increase the Reserve Force. Given that the current manning levels in the Reserves are below authorized strength, how do you plan to boost recruitment and retention in the future? LGen Paul Wynnyk: In the Defence Policy, you’ll see that there’s an explicit statement to increase the size of the regular Canadian Armed Forces by 3,500 and the Reserves by about 1,500. Most of the 3,500 will go into what we call joint enablers — intelligence, cyber — so not necessarily service-specific. And of the 1,500 Reserve positions, approximately 900 will come to the Army Reserves as we go forward. Yes, we are below manning levels in some critical trades. Two that really come to mind for me are some of our signals trades and mechanics. There’s just, quite frankly, a lot of demand in the civilian world for technological trades, so we need to produce more signalers — those who work with radios, computers, really on that technological edge. We also need more maintainers — those who fix vehicles, weapons and equipment. Once again, these skills are in high demand in the civilian world. But as technology becomes more sophisticated, our vehicles, our weapons become more and more sophisticated as well, which means the training time to get somebody up to the qualified level takes longer and longer. So, getting back to the maintainers, I think we’ve actually recruited a sufficient number, but we don’t have a sufficient number of trained maintainers right now. It takes almost two, sometimes three years to get them to the level that we require. Esprit de Corps: There is currently an emphasis on the Canadian Armed Forces being fully interoperable among the branches, and with select allied militaries. Is there a blueprint in place for the Canadian Army to achieve this goal? LGen Paul Wynnyk: Absolutely. In fact, there are a number of organizations; there’s an organization called ABCA Armies — the American British Canadian Australian and New Zealand Armies’ Program, which also includes the U.S. Marine Corps, where we get together very frequently and discuss interoperability issues, equipment capabilities, and the conduct of exercises where we can develop interoperability and find out where the problems are, and address them as we go forward. And that has been long-standing. We work with traditional allies there and, as you realize, some of those allies — the U.S. and the U.K. in particular — are part of NATO, so a lot of that interoperability is fungible — it can move backwards and forwards between alliances. So, I would say that we build around our core alliances. And many of the NATO standards are based on some of the work that’s done in ABCA. Interoperability is a key aspect of our profession. Because, as we deploy on operations — historically, even the very first expeditionary operation that Canada did was in 1884 as part of the Nile Expedition and we didn’t do it alone, we worked with the British— every deployment we’ve ever done has been in concert with our allies. Interoperability is fundamental. Who was your greatest influence while growing up? My dad. He was a great dad. He was a Second World War veteran, the commanding officer of my army cadet corps and my high school principal. It was hard to escape him! Who would you consider to be a hero? It’s not one but many – the spouses and partners who support our men and women in uniform. What was your first job? I worked in a beer bottle depot, loading beer bottles onto trucks. What do you consider a ‘guilty pleasure’? Soft ice cream and scotch — but never together. When was the last time you cried? It was at Christmas because my wife and I were laughing so hard. I can’t remember what it was about. What is your favourite fast food outlet? A&W. I’m a teen burger guy. What is your favourite sports team? The Edmonton Eskimos. Favourite vacation spot? Anywhere near a trout stream in the Rocky Mountains. Worst memory from basic officer training? I don’t remember basic officer training. That was 35 years ago. [laughs] I love my job. I have loved every aspect of this career. If you asked me for any bad memories, in the military I’d be hard pressed to come up with something. Best day of your career (so far)? I would say, anytime the Army Sergeant Major and I can get out of the office and spend time with soldiers.